On the tropical Malabar Coast in southern India, Kerala offers travellers a slower pace of life. Away from the honking horns and bustling streets of Delhi, India’s most tranquil state is made up of pristine white sand beaches, palm tree-lined backwaters and lush, green countryside. Kerala is perfect for travellers wishing to get a taste of India without the chaos that comes with major towns and cities. With its own unique cuisine and a relaxed approach to tourism, we’re sure you won’t be disappointed with your visit to Kerala. We wanted to find out what Els thought of Kerala: “I spent two weeks in Kerala. The highlight was the abundant nature. Whether it’s admiring the tea plantations around Munnar, hiking Phantom’s head or kayaking along Kerala’s backwaters, you cannot help but be in awe of the gorgeous landscapes that surround you. With Els’ words in mind, read on to find out everything you need to know about Kerala, and what to expect from your holiday to India. Kerala’s population is roughly 33 million – though you’d never know it. The state’s tranquil backwaters are home to many people living in waterfront homes and in towns and cities beyond the countryside, but there’s an air of calm about the region. 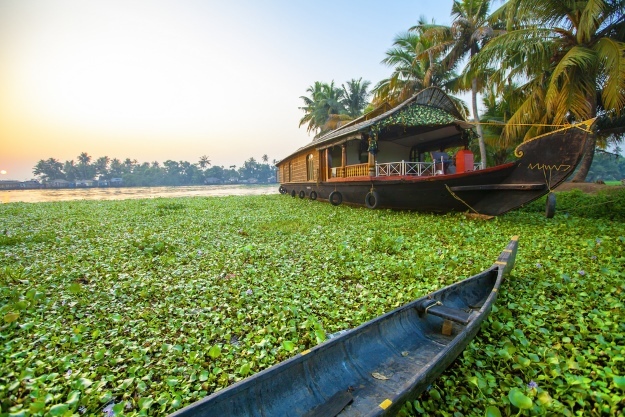 Kerala’s backwaters are a chain of lakes and lagoons wending through the state. Stretching for over 900km, the best way to experience this network is by boat. 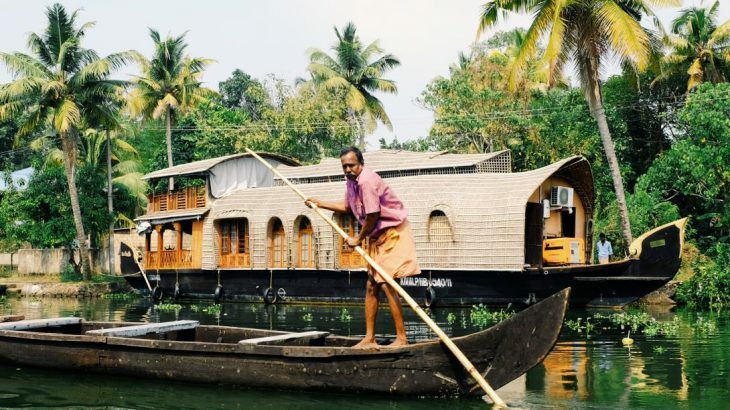 On your holiday, you can board a converted rice barge and cruise on the backwaters. As you glide through this watery paradise, you’ll get the chance to stop at various towns and villages to meet the locals and sample authentic Keralan cuisine. Kochi (or Cochin) is a port city filled with hidden treasures. Colonial architecture and places of worship are evidence of the city’s diverse population. Kochi is a melting pot of cultures and communities, all living harmoniously in this pretty waterfront city. St Francis Church, believed to be the oldest European-built church in India, is well worth a visit on your holiday to India. The stunning church was built in 1503 by the Portuguese as a Roman Catholic Church, and is the burial place of explorer Vasco De Gama. Although his remains were moved to Lisbon 14 years later, you can still visit his tombstone at the church. 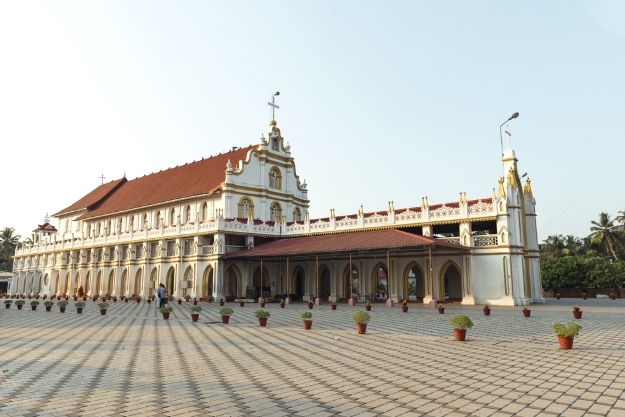 To continue your exploration of Kerala’s churches, head to Santa Cruz Cathedral Basilica – considered to be one of the finest churches in India. Kochi is also famous for its spectacular Chinese fishing nets. Widely credited as being the most popular sight in the city, the nets were said to have been introduced to local fishermen by Chinese explorer Zheng He in the 14th century. Don’t forget your camera! Periyar National Park is an elephant and tiger reserve near the district of Thekkady. Here you can see rare and endangered plants and flowers, as well as some of India’s most majestic animals. High in the Cardamom Hills, look out for Bengal tigers, wild pigs, sloth bears and Travancore flying squirrels. 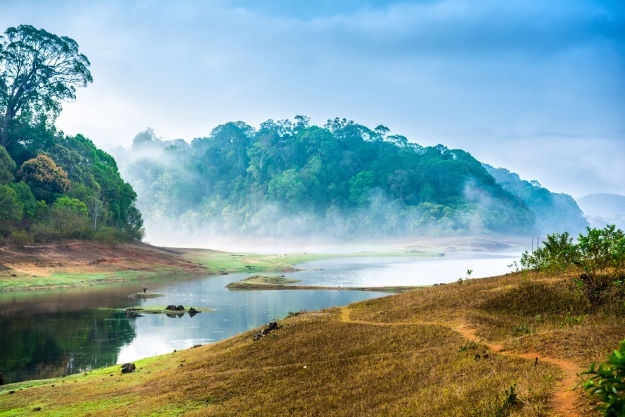 The park is open all year round, and on some of our holidays to India, you’ll get the chance to explore the area in depth on a safari and boat ride, or ride on a bamboo raft on a lake in the heart of Periyar Tiger Reserve. Situated between the Arabian Sea and Lake Vembanad, the vibrant city of Alleppey is considered the gateway to Kerala’s backwaters. Also known as Alappuzha, the city is best-known for its quaint houseboats which offer cruises through the wild backwaters. Lined with churches, temples and paddy fields, it’s difficult not to fall in love with the region. Alleppey is the essence of Kerala, and a tranquil place to while away few days. One of the reasons why many travellers seek out Kerala is the state’s stunning beaches. 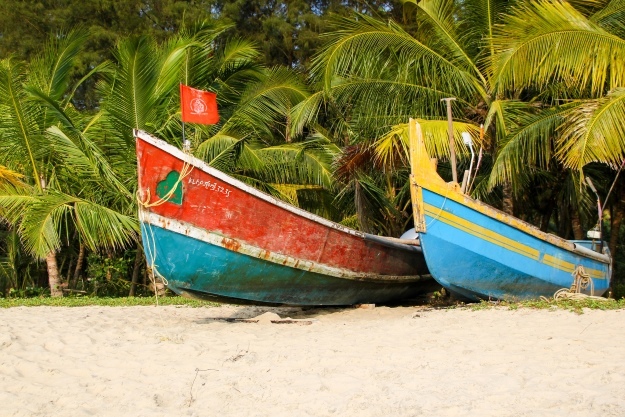 Colourful boats often sit on the shore, with palm trees waving in the wind behind. Fortunately, the district of Alleppey is home to two magnificent beaches. Marari Beach, near the city of Mararikulam, is widely considered to be one of India’s most beautiful beaches. Crystal clear water and a desert island-feel make it the ideal place to stop, slow down and reflect on your adventures in India. If you want a break from relaxing, head into the city of Mararikulam to visit its many historic sites, such as Mararikulam Shiva Temple and St Thomas Church. Kerala’s lush fields and forests extend into the Western Ghats mountain range. 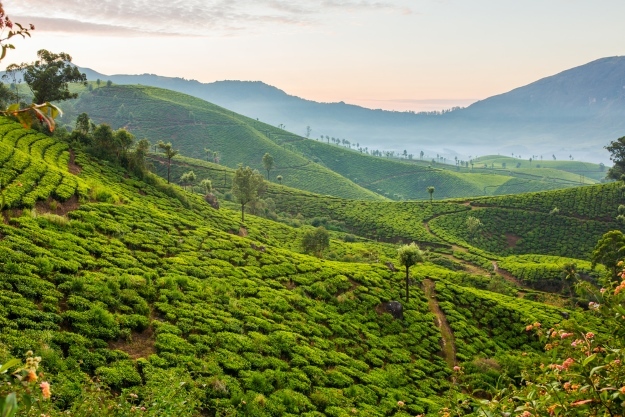 During your tour of India, you can stop at Munnar – a picturesque town surrounded by tea plantations and spice gardens. Here, you can discover the country’s strong roots in the tea industry (a visit to the Tata Tea Museum is included in our tours) and hike among the landscaped scenery. Munnar rises 1,600 metres above sea level, and was once the prime summer resort of the British Government in Southern India. Among its abundance of flora and fauna, one particular flower, the Neelakurinji, paints the hills in blue once every 12 years, with the next blooms due in 2018 and 2030. The region is also home to the highest peak in South India – Anamudi – which rises 2,695 metres. If you’d like to get better acquainted with the hills and mountains of Munnar, join an escorted tour of Kerala to hike to the Letchmi hills, through plantations and forests. Thiruvananthapuram, or Trivandrum for short, is the capital of Kerala. Famous for its well-kept British colonial architecture and thriving arts scene, this city is a unique stop on your holiday to India. History buffs will enjoy visiting the Sri Padmanabhaswamy Temple, built in a blend of indigenous Kerala style and Tamil style, Kuthiramalika Temple, a palace built by the Maharaja of the Kingdom of Travancore, British India – Swathi Thirunal Rama Varma, as well as the fascinating natural history museum, Napier Museum. Wander through local markets and stop by some of the city’s many art galleries to get a true sense of Trivandrum’s special culture. The old port town of Kodungallur is a melting pot of religions from all over the world. Christians, Jews, Hindus and Muslims all settled in the town centuries ago, and today is a wonderful example of Kerala’s diverse culture. 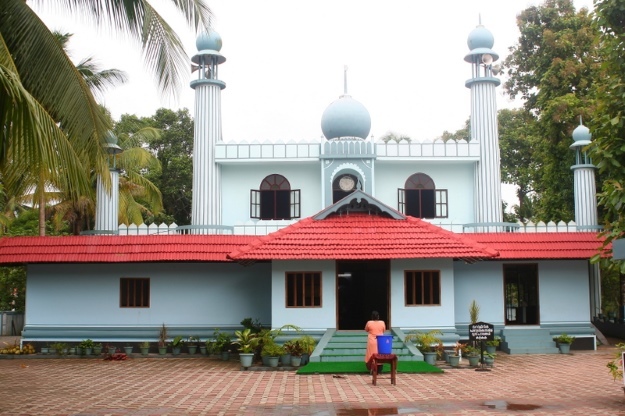 Among the highlights of this pretty port town is Cheraman Masjid – India’s first mosque. Built in 629 AD by Malik Deenar, one of the first known Muslims to have come to India, the mosque is of great historic and religious significance. Kottakavu Church, built in 52 AD, is another worthy stop on your visit to Kodungallur, as it was established by St. Thomas, one of the twelve apostles of Jesus Christ. Keralan cuisine is distinct from the rest of India. With Greek, Chinese, Portuguese, Arab and Dutch influences, the food is a unique blend of cultures from all over the world. Many dishes use a generous amount of coconut, chilli and spices in vegetarian, meat and seafood dishes. The Arab-influenced cuisine of the Mappila community is considered to feature some of Kerala’s most fragrant dishes. Cardamom and cloves feature heavily in many Mappila dishes, including the cuisine’s most popular meal – biriyani. Seafood lovers won’t be disappointed with Keralan cuisine. Snapper, rockfish, lobster and squid can be found in abundance off the coasts, so you can expect the freshest fish here. 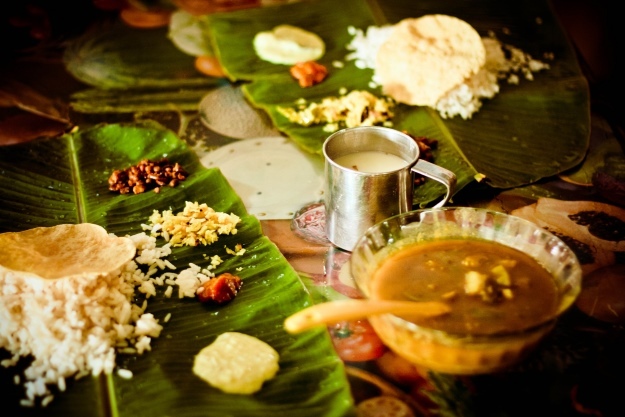 Vegetarians will also be well catered for, as the Hindu population of Kerala is renowned for serving an impressive vegetarian feast called a sadhya – a platter of vegetarian dishes served on a banana leaf. Some of the most exciting Keralan dishes to look out for are appam and stew, a Keralan staple made with chicken, mutton or vegetables, Mappila biriyani, a rice dish with ghee (butter), dry fruit and meat, and avial, a thick coconut and vegetable curry. If you’re feeling inspired, take a look at our holidays to India to find your dream adventure. 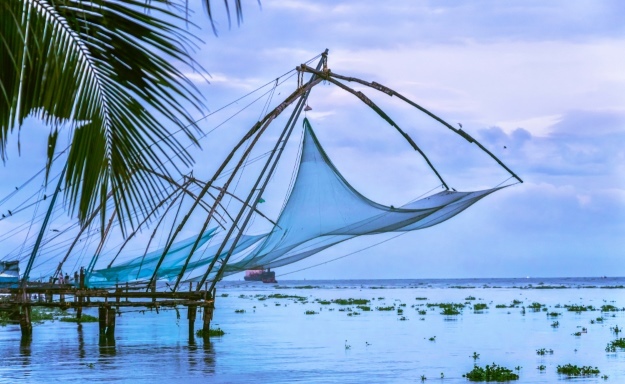 Whether you just want to explore Kerala or venture further afield, each tour has been designed to give you the most authentic experience of India. India adventure, culture, Kerala, top things to see. permalink.